"In the Jurassic World, the dinosaurs reign supreme and no one feels strong enough to disturb them during lunch..."
What's simpler than recreating the Jurassic World in your boy's room with the E-Glue dinosaur wall stickers ! Diplodocus, Triceratops, Parasaurolophus and other flying dinosaurs will take care of your kids every night and day. 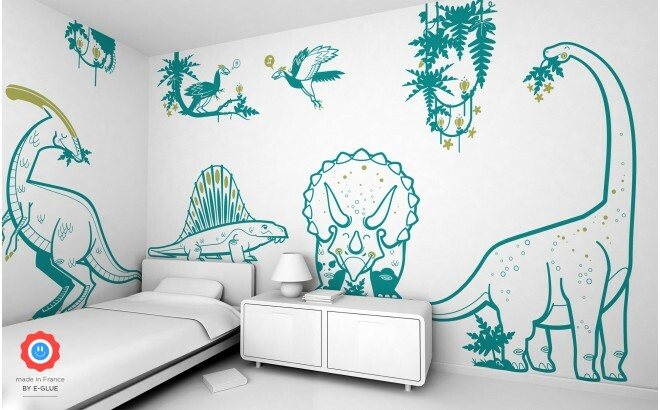 For example, see below a wall decal Triceratops (bahamas blue and oasis) applied on a light grey wall.